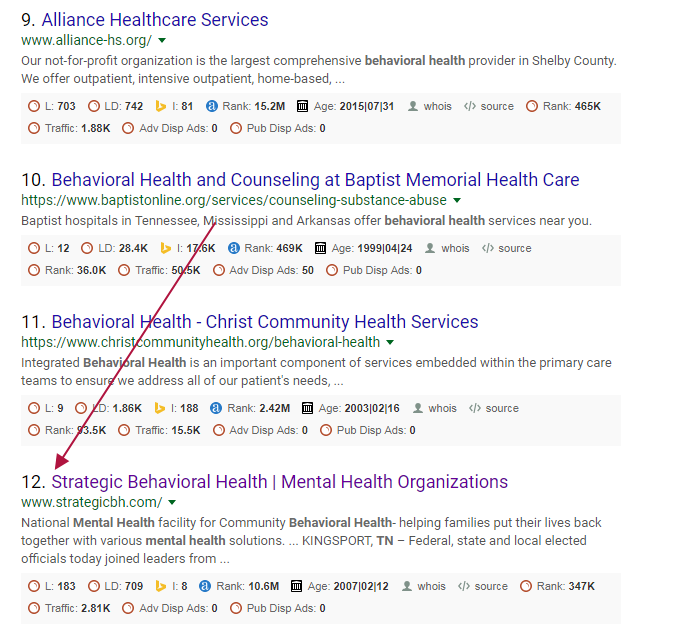 Today, we are going to tear down the “www.strategicbh.com“, a mental health behavioral website and analyze what they are doing in their SEO and digital marketing effort. But interestingly they are not present on the First page in the organic listings. Infact, they show up on the second page at #12. Let’s have a look at the organic traffic this website generates every month using some software; SEM Rush. Looking at the chart below, they are getting a consistent traffic of around 2800 visitors every month. This is not including any paid traffic. Their traffic is consistent and they rank for over 700 keywords. The amount of traffic they receive would cost around $22,000 every month if they were not ranking organically in Google. That is really a good thing to have. Let us see what keywords they rank and what are the various opportunities they can improve upon. The important thing to know is what are the different keywords a potential customer reaches your website. This happens during discovery phase or validation phase. Strategic Behavioral Health is a parent company and has lot of subsidiary facilities in different locations across the country. They are receiving lot of search visitors through these different queries by each location. What are the other queries that they are receiving traffic for? As you see the majority of their Google visitors are coming from branded query results. This means there must be lot of opportunities where they are not ranking. Let us see the keywords for which their website is ranking but not on the first page. As you see there is so much opportunity to bring additional traffic to the website. We just picked few of the keywords from a list of 700+ for which Google recognizes their website. This illustrates how easy it would be to bring an additional traffic of over 5000 more visitors every month. According to a study in 2013, the 1st position receives 32.5% of the traffic! If you don’t appear on the first page of Google, you’re pretty much non-existent, when was the last time you clicked on the 2nd page on Google? So as we saw in the previous section the website is ranking for ton of keywords but they are not first page rankings and hence most of their traffic is coming from branded search queries. These are the top 3 competition website that are in the top 3 position of Google search query. If we just consider https://www.deltamedcenter.com and use SEMRush to analyze their website we can see that they receive a whopping 16,000 visitors every month. That is like 41 times greater traffic than Strategic Behavioral Health website. Plus they rank for a massive 10,000 keywords. Now that we reviewed their Search Engine results and competition let us dig into their website and see what they are doing better and where we can find opportunities to improve. The first thing upon landing on their website we notice that there is no SSL certificate. First of all, recent changes in Google Chrome meant that Google now show this pretty warning on every page of your site. It’s fair to say it doesn’t give off the most professional impression. Similarly, there is a small ranking boost to having a secure website, as noted back in 2014. It’s likely only small, but a boost is a boost. One can get SSL certificates for free these days so there really isn’t much reason not to have one. And for a Health Care website there are absolutely rules around HIPAA for security purpose. A good website design always includes a solid Call-To-Action and this is clearly missing on the website. When we click on the “Contact-Us” it takes us to the page with a list of websites for different locations. Even though the main website is receiving over 2800 visitors every month, it is spreading out all the traffic to its different location based websites. There are various strategies to link out to subsidiary websites and this website is not leveraging them to the fullest extent. 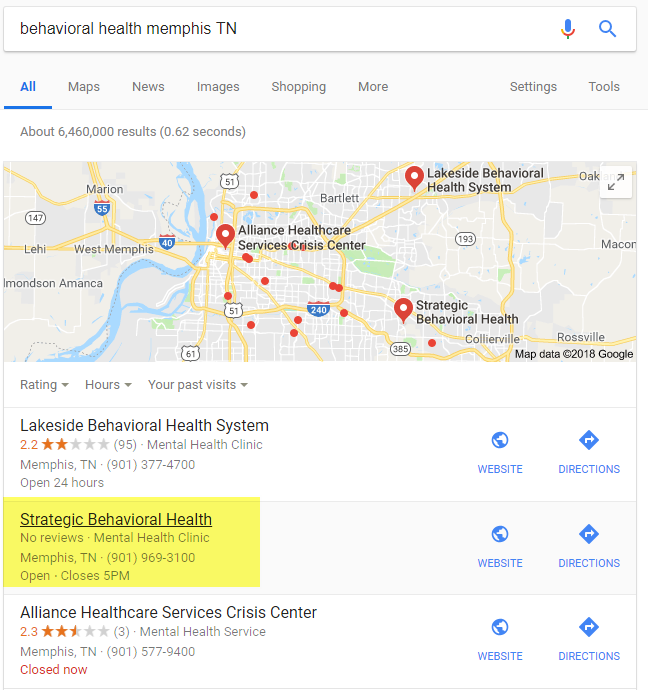 It is obvious that Strategy Behavioral Health is doing many things correct in order to bring 2800 visitors every month to their website. But there is ton of opportunity that they are missing out. If they focused on fixing the immediate on-site issues and optimized the pages for the keywords they could easily bring in more than 5000 additional visitors to their website. Another thing to focus would be on the local websites and see how they are ranking within their respective cities and how much traffic they bring in. 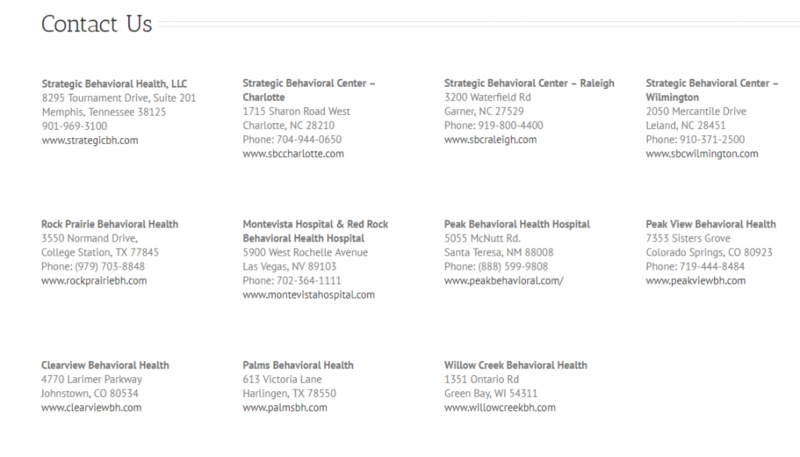 We work with several Pittsburgh based Behavioral Health Companies and across the country. We have helped them with their analytical and dashboard requirements and now helping them generate more revenue by increasing their website exposure. Would you benefit from having at least 1,000 new visitors to your site every month? Then, let’s work together! You can focus on your business, we will focus on ranking your site! If you’re interested in working together, drop us a line and we will connect.